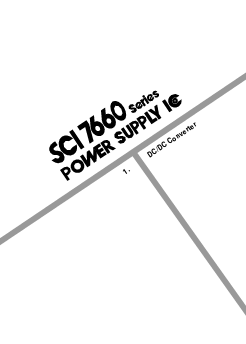 The SCI7660 Series is a highly efficient CMOS DC/DC converter for doubling an input voltage. This power saving IC allows portable computers and similar hand held equipment to operate from a single power supply, even when they incorporate LSIs that operate at voltages different from those of logic circuits, for example, LCD drivers and analog LSIs. The SCI7660C0B is available in 8-pin plastic DIPs, and the SCI7660M0B, in 8-pin plastic SOPs.